By Dan Ambrose: The December 3rd rematch between Antonio Margarito (38-7, 27 KO’s) and WBA junior middleweight champion Miguel Cotto (36-2, 29 KO’s) will have a small 153 pound catchweight for Cotto, but won’t contain the 160 pound cap that he had requested for the morning of the fight. The weight cap would have pretty much guaranteed that Margarito came into the fight weight-drained, weak and vulnerable. This, along with 150 pound catchweight, were what the 30-year-old Cotto was asking for before he’d face Margarito again in their fight at the Madison Square Garden, New York, New York. What was confusing about all this is that Cotto had already fought twice at junior middleweight without the cap or the catchweight handicap against the light hitting Yuri Foreman and Ricardo Mayorga. But now suddenly Cotto was asking for a handicap catchweight and cap against Margarito, a fighter that hasn’t won a fight in over two years and recently took such a savage beating at the hands of Manny Pacquiao that he needed surgery to fix the damage. It would seem that Cotto is safe this time around and in a strong position to win the fight without any gimmicks. Cotto lost by an 11th round TKO to Margarito three years ago in July 2008. 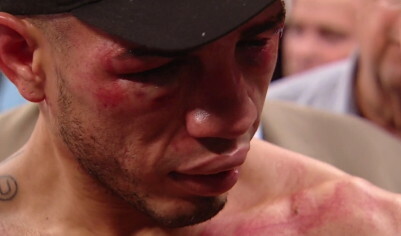 Cotto was left a bloody mess in that fight, and was forced to take a couple of knees to escape the punishment. However, that Margarito doesn’t exist anymore, as he doesn’t throw punches with the same kind of power he did then and he doesn’t throw nearly as many either. Margarito has aged, and so has Cotto. Other than a beating by Pacquiao in 2009, Cotto has been playing it safe in the last two fights against 38-year-old Ricardo Mayorga, and weak punching Foreman. And now Cotto is facing a fighter that many boxing fans see as completely shot in Margarito. It’s the third easy fight for Cotto, and not the one that boxing fans want to see. Fans want to see Cotto fight Sergio Martinez, the best fighter in the middleweight and previous best in the junior middleweight division. Cotto isn’t eager to take that fight for some reason. Fans also want to see Cotto fight Julio Cesar Chavez Jr., the WBC middleweight paper champion, if nothing else than to see Cotto take out and expose Chavez Jr. However, Bob Arum, the promoter for both Chavez Jr. and Cotto, is waiting and letting Chavez Jr. milk his newly won title against weak opposition. Cotto will come but only after a little milking has been done and Chavez Jr. has his back against the wall where he has to defend his title against someone that would beat him like Martinez and Marco Antonio Rubio.